Let's see.. a couple of weeks ago, a bunch of us learned and played Texas Hold-em at Shade Tree Coffee. That was fun. After I polished off a decaf mocha frappe, I ordered a frosty mint and caramel Italian soda. That was a good combination, but plain cinnamon is probably better. I was trying to replicate the sensation of eating a mint leaf soaked in the caramel syrup left over from a serving of creme caramel. I really need to learn to make that now that Pyewacket is no more. They had the best and smoothest of any I've eaten. Guitar practice that weekend went well and we went to El Corral afterwards. Sitting on the Dock of Bay was still hard and I probably played it worse than the week before. 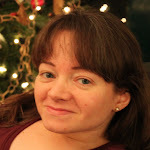 At some point I wrote a survey for the Durham FM Association using surveymonkey.com. That was very easy to do and I recommend it if you're thinking of writing a free on-line survey with fewer than 100 expected submissions. We also had a Durham FM Association meeting at our new location, at Shoney's. It was crowded and the food was greasy, but I think almost everyone had a really good time. My mom bought me some acid free photo albums from CostCo that hold 4" x 6" photos and have areas for writing next to each picture. 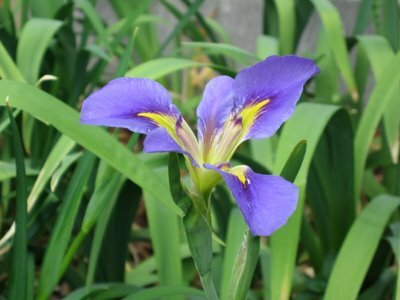 At first I was skeptical, because I've been researching what I want for a while, but they seem pretty cool. 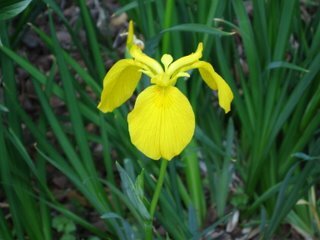 Now I've spent quite a bit of time going through old pictures and trying to put them in some sort of chronological order or at least clumps of pictures that are in order within each clump. 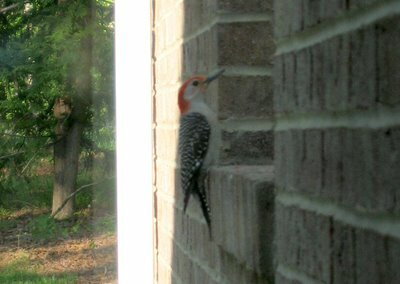 Yes, my woodpecker still visits me daily. 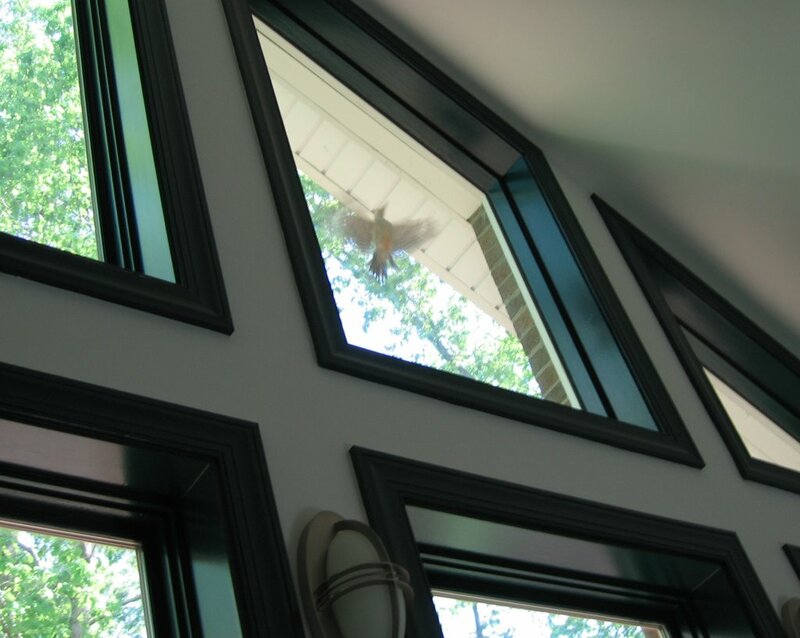 He doesn't peck the glass every moment of every waking hour (anymore), but I don't believe a day has gone by when I haven't heard him in the morning (he gives new meaning to the phrase "crack of dawn") or seen him attempt to defeat the window when I get home from work. He does appear to be slowly losing interest. Very slowly. Again, the telescoping duster does make him fly away, so he can't drive me crazy like he did the first weekend. 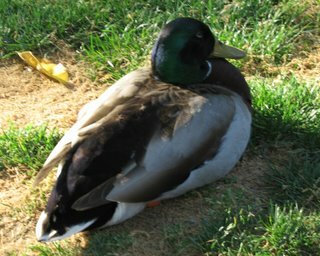 As I've mentioned in earlier posts, mallard ducks visit Duke's campus every spring now and LA brought in some stale bread a week or so ago, so we could feed them. This provided me with an opportunity to try out videoegg.com for the first time. This week has had the most consistently nice weather that I can remember. It's been cool during the night and just glorious during the day, with a nice (sometimes very strong) breeze. I've been eating outside at lunchtime at the new teak tables that they've placed on the patio close to the library. It's so peaceful there. It just hasn't been peaceful at home. 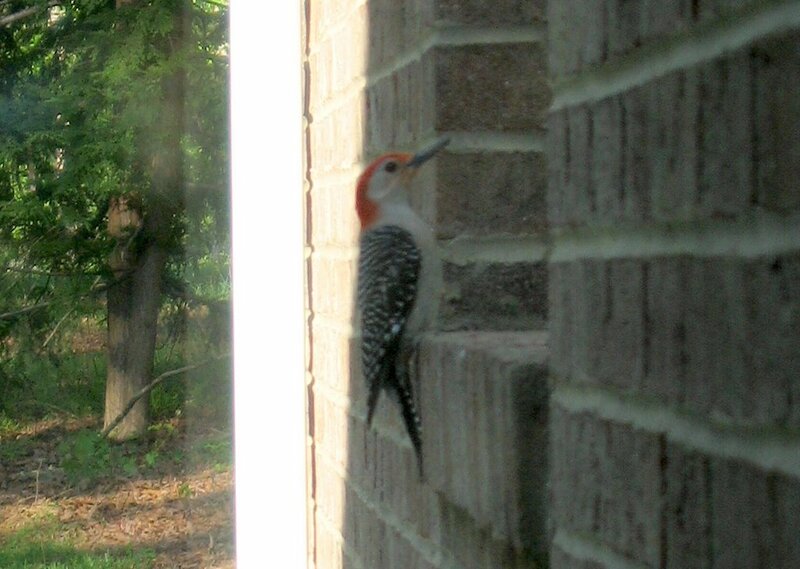 That is because a lunatic woodpecker has been banging his head against my windows for at least five days. Solid. I woke up on Saturday morning and wondered if someone in the neighborhood were doing some heavy construction. BAM! BAM! bambam! I looked around outside, through the windows, and finally saw that Doofus, here, was ramming into the garage window. 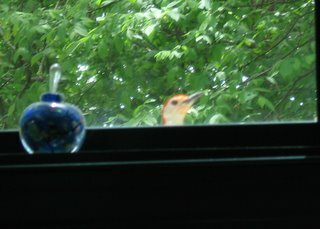 I'm sure he sees his reflection as a male red bellied woodpecker in the window and sees it as a threat. He did it all weekend long and by Monday I was really happy to go to work. I wake up every morning to the noise of his impacts and he's still at it when I come home at night. He mostly picks on the great room windows in the upper right hand corners. According to what I've read on the web, he would just move to another window if I put something up there (assuming I could reach), but he didn't seem to like my telescoping duster. Last week was fun. We had out 6th Annual CIT Showcase, for faculty to show off how they incorporated technology into their teaching. We gave away all the doorprizes that I collected and the lunch bags with the CIT logo on them that we ordered. It was all very exciting had we had a record turn out. We hauled stuff to and from the Bryan Center in my van and it was nice to be able to help out in that way. It was pouring rain all day, the day of the Showcase, so I naturally got soaked at one or more points, when I had to go back to the library. Mallard ducks have invaded the campus and I almost had a semi-head on collision with a security guard on a bicycle, because we were both trying to avoid running into the same duck. The photo of the one pictured here was taken a few days earlier. One very unexpected and cool thing was that SW presented at the Showcase and got to visit my house. We also had dinner with GM at Margaret's Cantina that Friday night. Despite some delicious sounding specials, I found I was craving a shrimp quesadilla with shrimp and guacamole. Afterwards GM and I both had chocolate bread pudding with Mexican chocolate chunk ice cream. It wasn't quite as good as the chocolate whiskey rum sauce that they used to have, but it was good. Absolutely gorgeous flowers have been blooming on campus. The irises below and above were blooming in the vicinity of Duke Chapel. 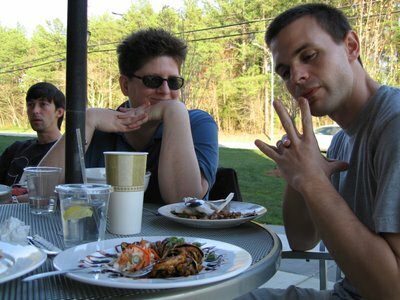 Earlier in April, I took this picture of JB and AE while they admired my chicken walnut roll at Chai's. I actually ate there again tonight, with AE, but my udon noodle soup wasn't beautiful enough for the blog or food envy. In the past month, we've had a lot of thunderstorms. 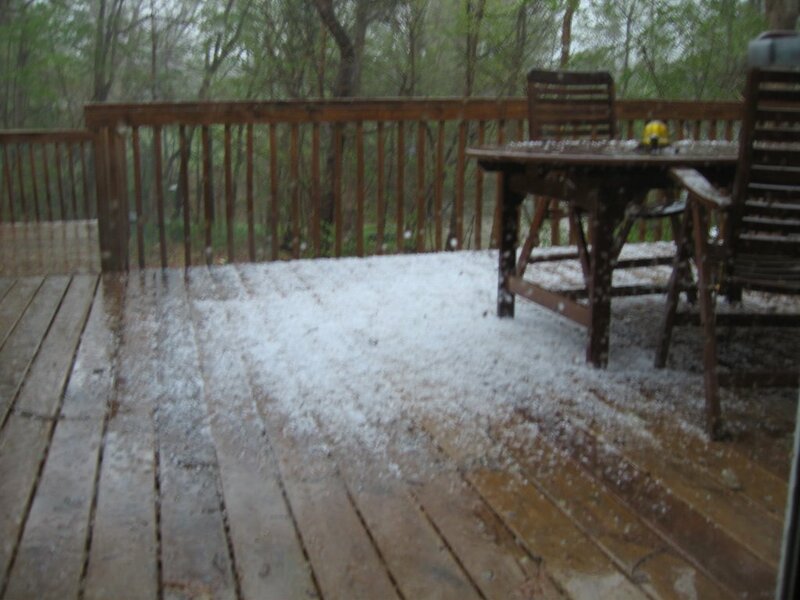 One of them even included some hail. One to two miles away, there were larger than golf ball sized hail stones, which is pretty scary. On my deck, it ranged from pea to marble sized hail. My parents, only 600 feet away, just had pea sized and there was less of it.